Popcorn is a delicious low-fat, low-calorie food that is a popular snack to munch on while watching your favorite movie or to stave off hunger pangs in between meals. According to the Popcorn Board, just three cups of popcorn equal one serving of whole grains. A cup of air-popped popcorn contains only 31 calories; 55 calories if popped with oil. Popcorn is still a low-calorie choice when lightly buttered, at 133 calories per one-cup serving. A bucket of popcorn contains 20 cups. A bucket of air-popped popcorn contains 611 calories and 6.72 grams of fat, according to the USDA Nutrient Database. A bucket of oil-popped popcorn contains 1,100 calories and 61.82 grams of fat. A bucket of movie theater popcorn contains 1160 calories and 77 grams of fat, according to Anderson University. 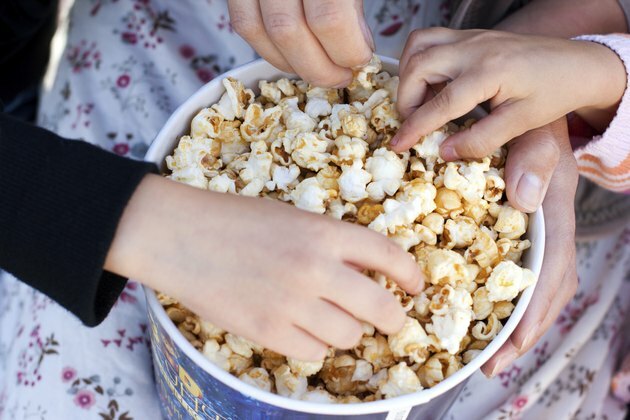 The same bucket of popcorn with butter added contains 1,640 calories and 126 grams of fat.